This side of the resort enables beginners to discover skiing in complete safety, with large green and blue slopes. Expert area slopestyle : offers a series of modules aimed at experts. Skicross : series of banked turns, tables, woops and slope ruptures for a sensational descent ! (developed on the advice of our champion Marion Josserand, bronze medallist in skicross at the 2010 Vancouver Olympics). 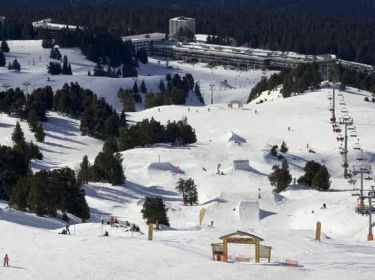 Intermediary area : some modules to practice slopestyle. Parallel slalom : free use enables you to compete with your friends. Beginner area : made up of ground movements such as whoops, is a very accessible area enabling you to become familiar with "freestyle". "Kilomère Lancé" : test your full speed with the mini timed speed skiing slope. The Sunset Park is a real play zone for everyone. Be watchful though and do not overestimate your own abilities when using these modules.